Sq. Ft.: 1708 sq. ft. Lot Size: 4465 sq. ft. Completely remodeled, looks brand new, and gorgeous! 2 BR/ 2 BA single level with open great room plan. 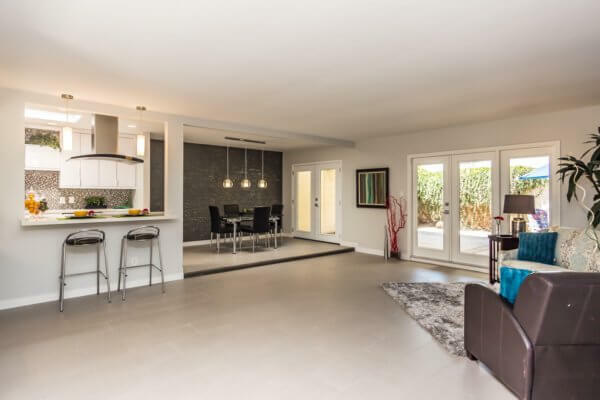 Soft contemporary with Bellmont white gloss cabinets in kitchen, new bathrooms, flooring, counters, paint, fixtures, water heater - nearly everything has been redone. Charming Sutton Place gated community - Biltmore area, center of everything, yet totally quiet location. Community pool and cabana ideal for group events. Even your own avocado tree in the front yard. This would be a perfect lock-and-leave home in the gorgeous Valley of the Sun, and it is move-in ready! Click to see larger images. Then click side arrow for next or top arrow for slideshow.